What is BBGV Charity Fun Run? BBGV Charity Fun Run is an annual event which allows everyone, regardless of age, gender, nationality to have fun with colleagues, friends, and families while raising the much-needed funding for the less fortunates throughout Vietnam. Over the past 18 years, the BBGV Charity Fun Run has achieved impressive numbers: Over 100,000 people have taken part in this exciting annual event and over 10 billion VND has been raised to benefit charities throughout Vietnam. This year, BBGV (British Business Group Vietnam) will hold their annual fun run on September 30th, 2018, and TRG International is delighted to be one of the In-kind Gold Sponsors for this event. Together, we hope to welcome around 10,000 runners to join this year’s event with the aim to raise 1 billion VND – which will support charitable projects supporting disadvantaged Vietnamese people. Especially, for each successful registration through TRG International, TRG will donate 150,000 VND to the BBGV charity fund. What’s more? By participating, you also have a chance to win attractive Fun Run prizes, Photo Contest and Lucky Draw from the organiser. At the TRG&PJ’s booth, we will host many fun activities for all participants, particularly, a limited number of PJ’s signature cold brew coffee will also be given out. So, don’t miss out on this wonderful chance! 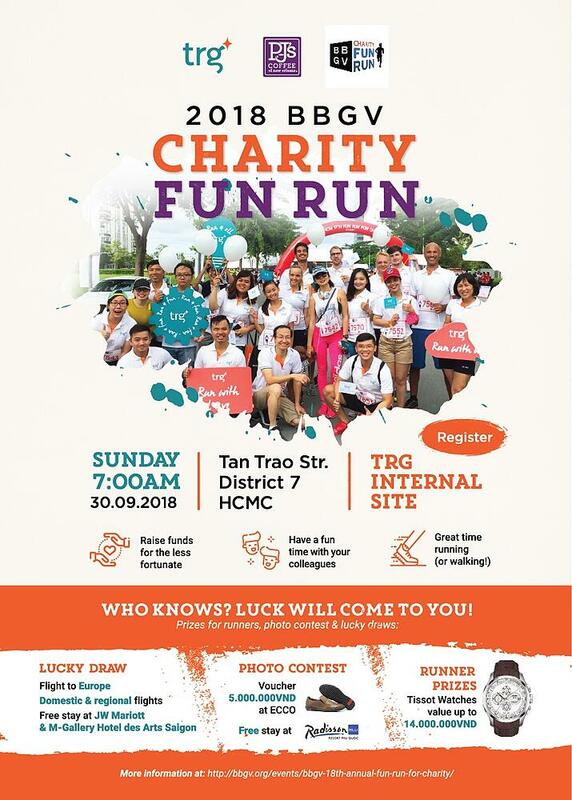 By taking part in the BBGV Fun Run for Charity this year, TRG International hopes to provide our staff with a relaxing time as well as to assist BBGV in their journey to support the most disadvantaged and to give back to the community. Let’s exercise, help our community, and have a great time running, walking and laughing with everyone under the sun! Click HERE to find more information about the 2018 BBGV Charity Fun Run.